A nice sunny day! 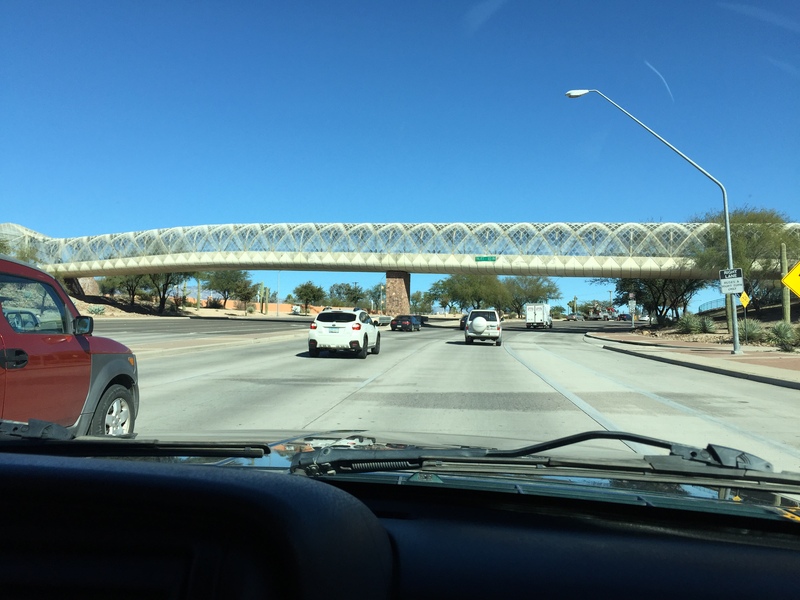 We started out with a drive in the country into the Tucson Mountain Park. Yes, forest. Being from the Midwest I always think of a forest as pine trees, so it took some getting used to seeing all the saguaro cactus instead. 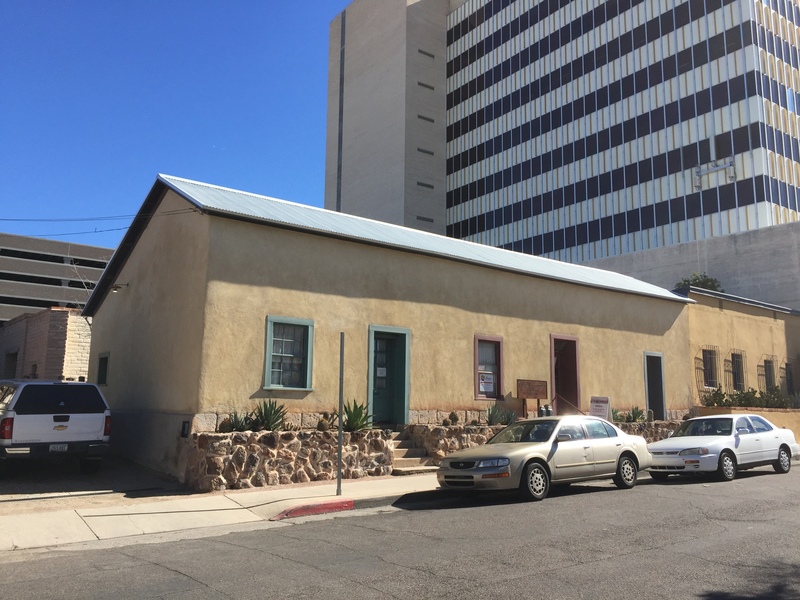 Then we drove in to see the Old Downtown Tucson. One of the first old buildings we found was the Old Town Artisans building. Inside is filled with several little interconnected shops of Southwest artsy stuff with an outdoor center court restaurant. We saw this horse-drawn carriage and asked for a ride but the driver said it was reserved and we could call ahead to reserve it another time. 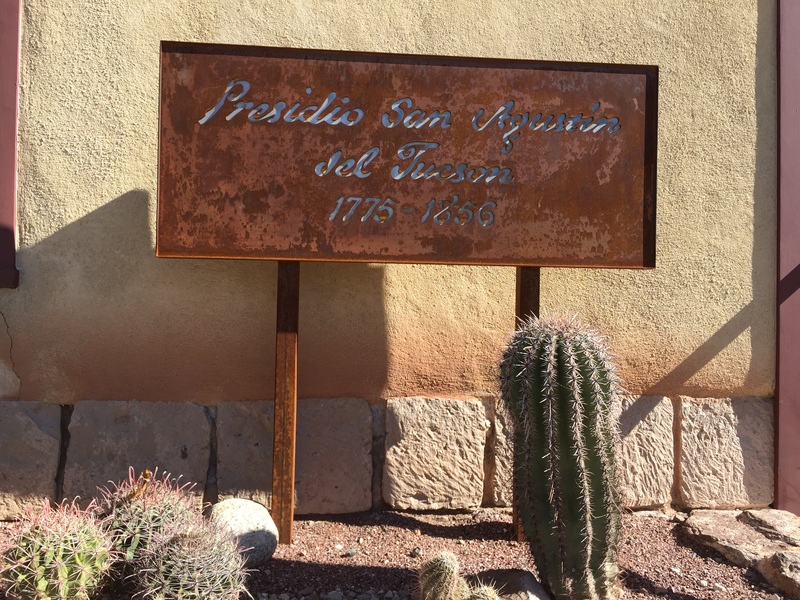 The main thing we wanted to see today was the Presidio San Augustin del Tucson. This is where Tucson got it’s beginning. Built in the late 1700’s. This 11-acre fort marked the northwestern edge of the Spanish frontier in Arizona. 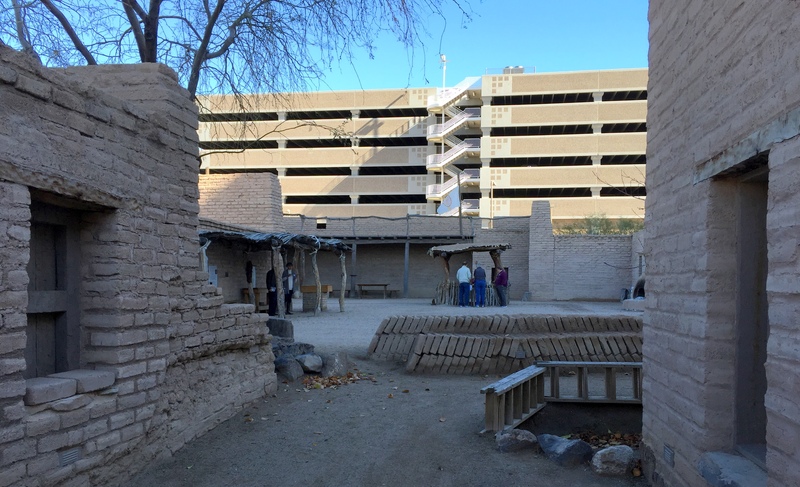 The fort is gone now, but the northeast corner of the Presidio has been reconstructed on its original site in downtown Tucson and is open to the public, free admission. Since the Presidio is in the heart of downtown it is in the shadow of a very tall building which makes my pictures dark. 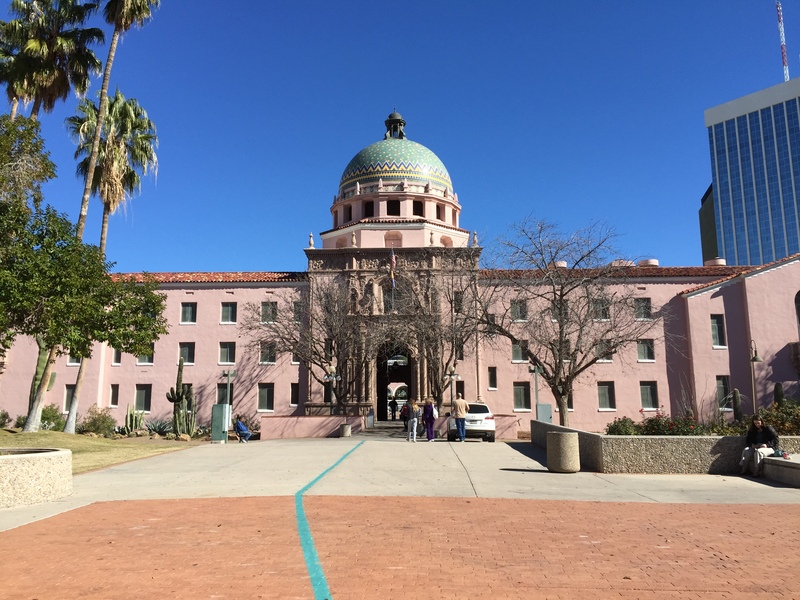 A few blocks over is the Pima County Courthouse, built in 1929 it is still in use today. 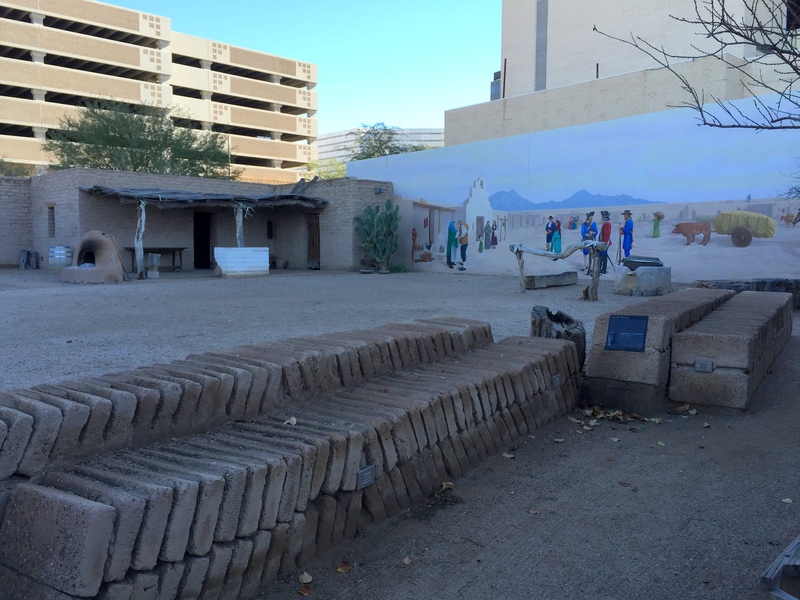 The turquoise painted line is part of a 2.5 mile Historical Walking tour of Downtown Tucson. The courthouse and several other buildings now sit within the 11 acres that used to be the Presidio grounds. 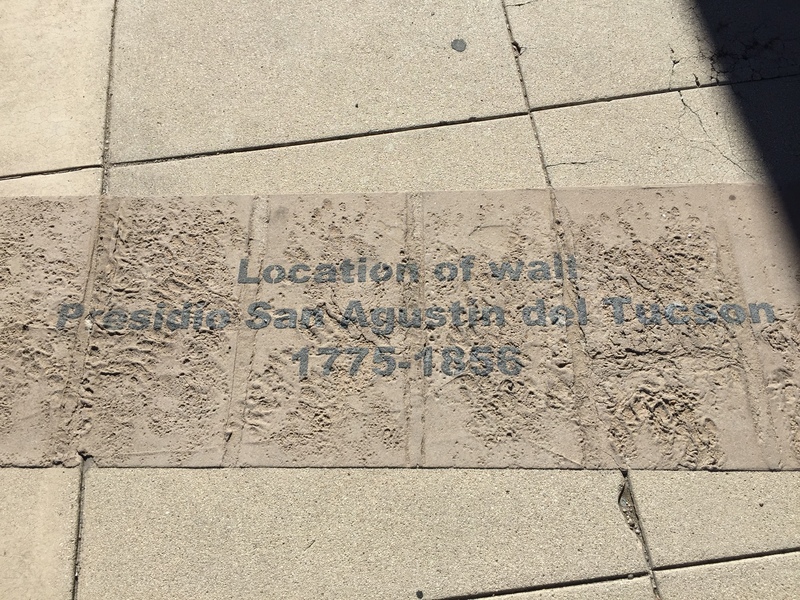 The location of the original Presidio walls is marked on walkways and courtyards. We also found the St. Augustine Cathedral. Begun in 1896. 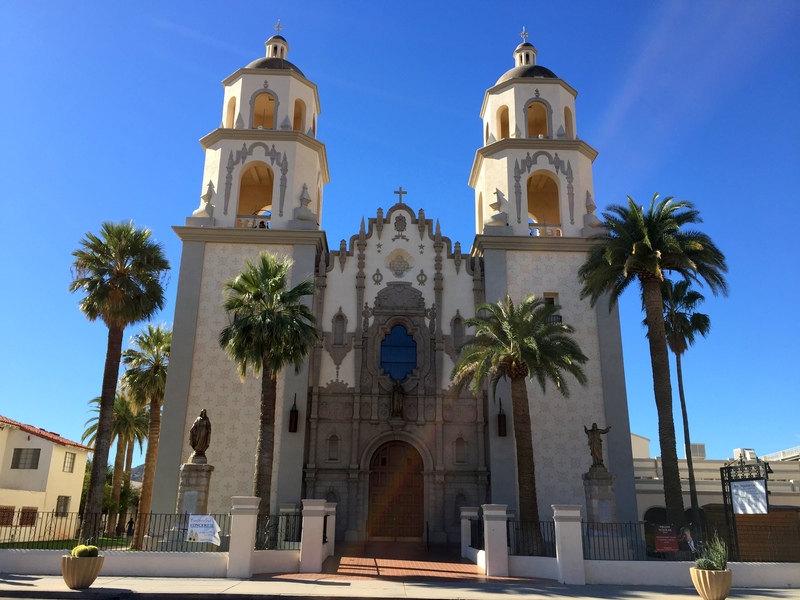 This Spanish Colonial Revival style church features saguaro, yucca, horned lizard, and various cacti on its facade. We tried the door, but it was locked. This beautiful band shell is on the church grounds. 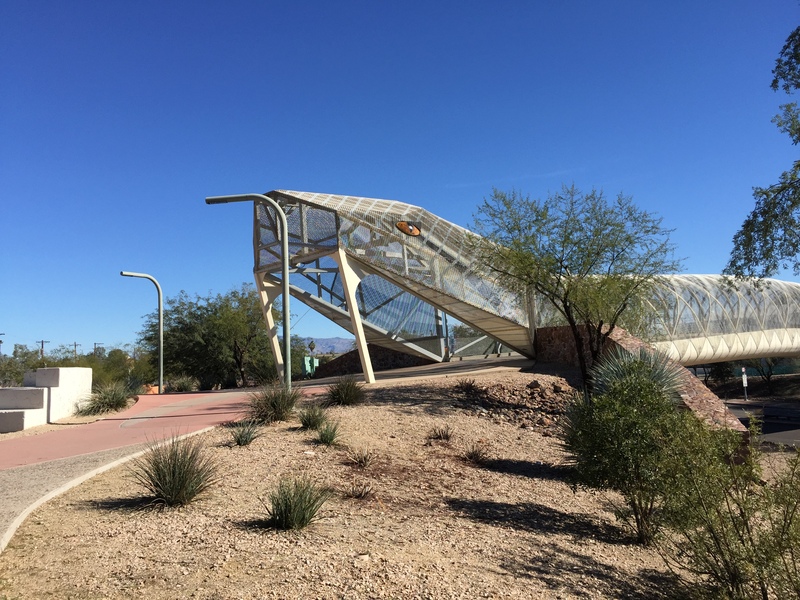 And then there is this interesting pedestrian bridge over Broadway Boulevard… it looks like a rattlesnake. 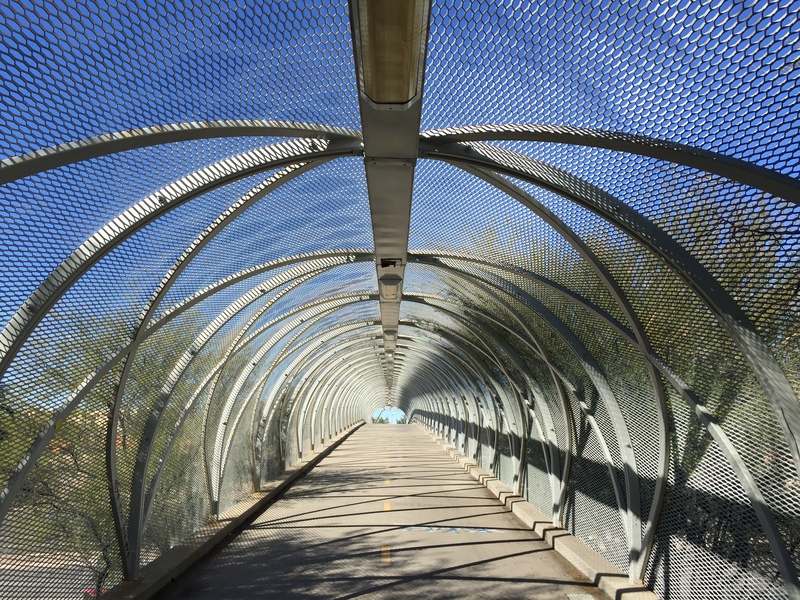 We found a place to park and walked the pedestrian/bike path from one end to the other. 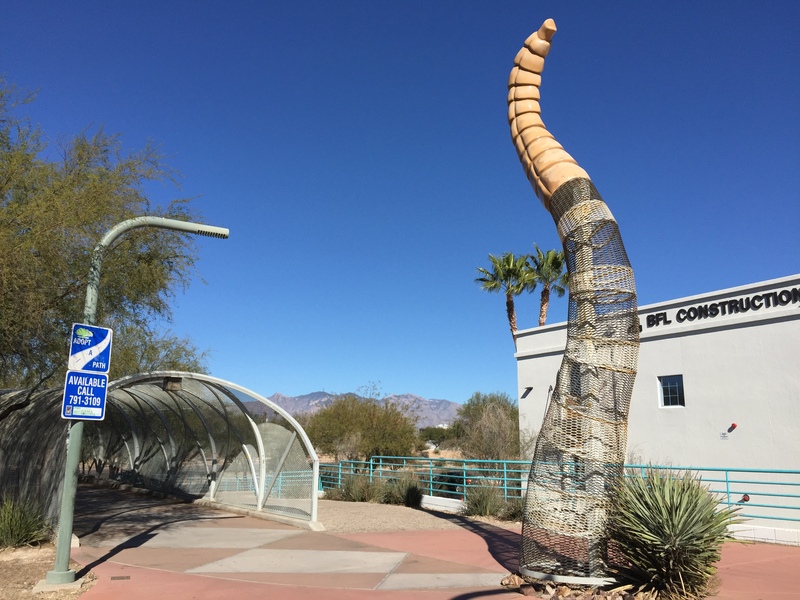 The entrance is the rattler’s head, fangs and all. The eyes used to light up at night, don’t think they do any more. The tail end used to contain a motion sensor that triggered an amplified rattling sound. That’s no longer working either. But cool anyway. 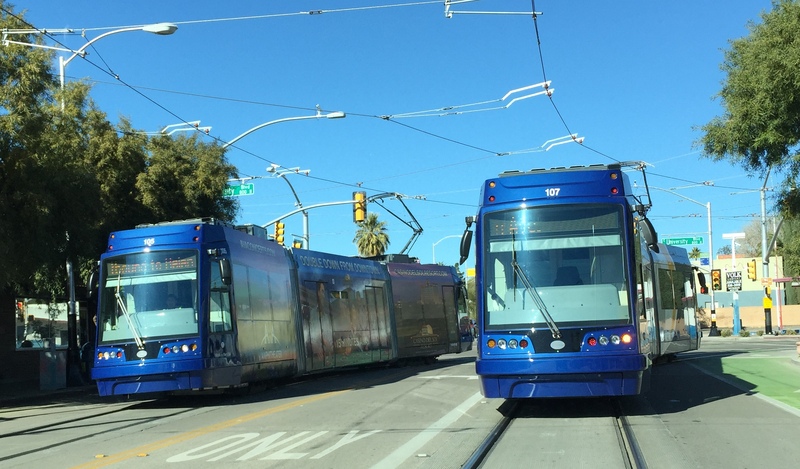 As we were driving back along the old downtown streets of Tucson we found ourselves driving on the streetcar rails. 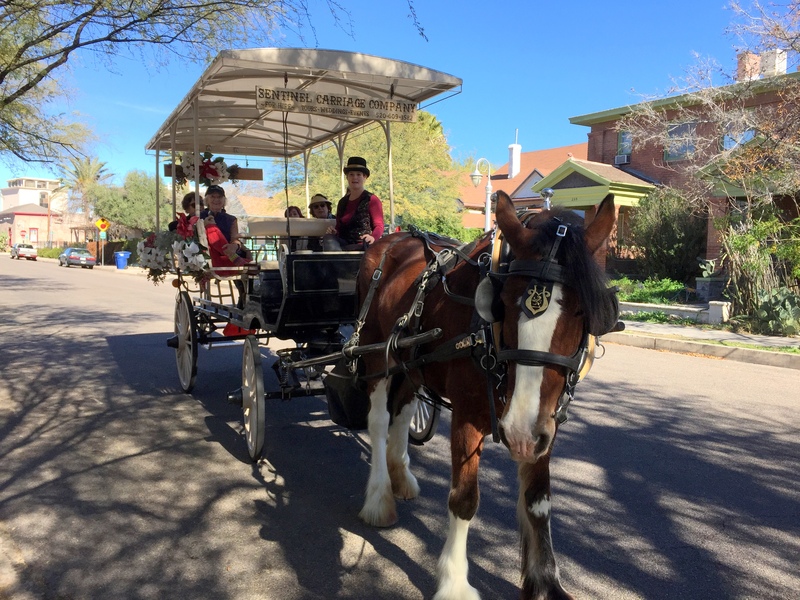 This is a brand new service for Tucson which just began in July 2014. 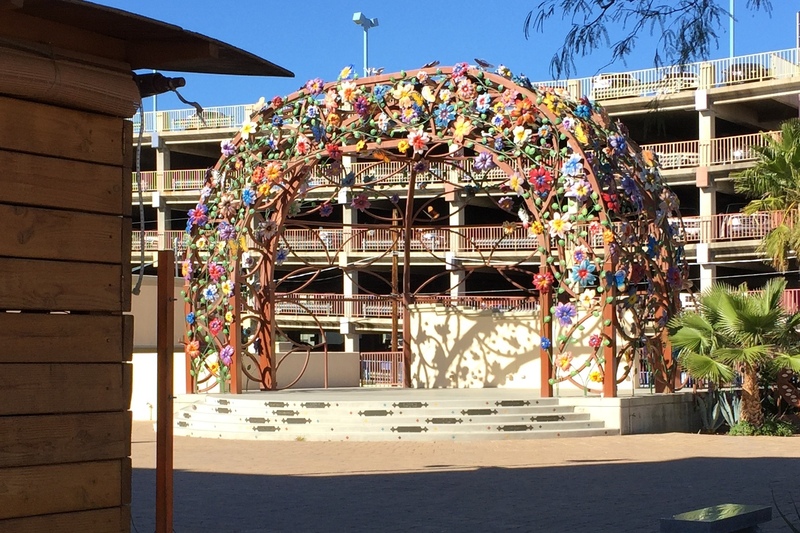 Good for Tucson. 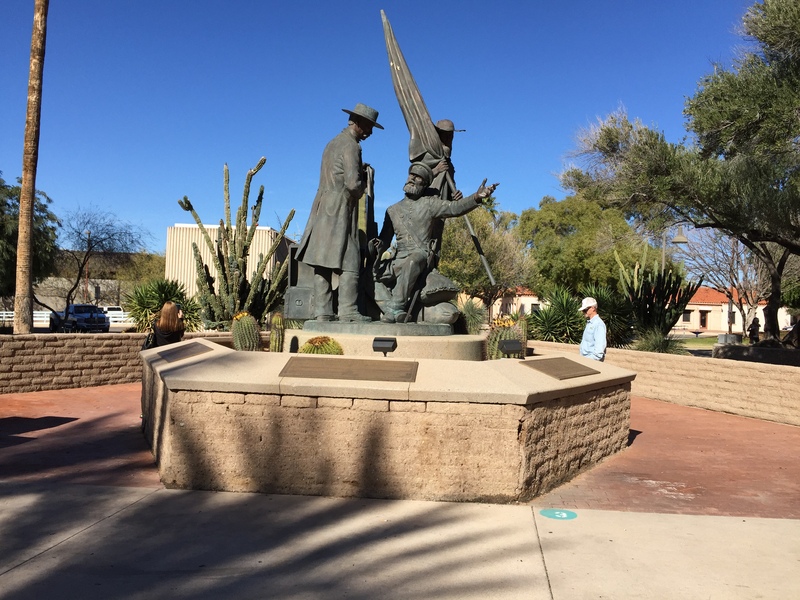 This entry was posted in Arizona, Daily Post, January and tagged Churches, courthouses, Presidio San Augustin del Tucson, Streetcar, Tucson AZ. Bookmark the permalink.